Garden expert Rex Murfitt has rock gardening tips for gardeners who need to downsize their gardens, but who still want the pleasures for growing plants. “Many of us spend our lives happily building a garden and just when it reaches a state of maturity, so do we,” says Murfit. Murfitt has had many gardening friends move into smaller homes with smaller gardens, where they now garden in raised beds, on patios, decks or balconies. For serious gardeners – whether older or younger – it can be very rewarding to use the available space and time to grow unusual plants, such as alpines. Dwarf or small rock garden plants are ideal for growing in raised beds, in pots or in special troughs. These plants are also suited tobalcony or roof-top gardens. Alpine plants evolved on high, windy sites with extreme climates, which means they can be difficult to grow in locations with hot summers, and in rich, moist soil. They need excellent drainage, sunlight, and lean and gritty soil. However, by understanding how to manipulate soil types, rock structures and exposures, lowland gardeners can grow ground-hugging plants from alpine regions of the world. These elegant plants are ideal for serious gardeners with limited growing space. Although the plants are small, the size of their flowers is relatively large, giving a gem-like look while in flower. In Creating and Planting Alpine Gardens: How to Build Small Rock Gardens and Work with Alpine Plants (published by B. B. Mackey Books), Murfitt shares the best of his rock gardening tips for small spaces. One attractive plan is to build raised beds in the garden or even over pavement. Since the topsoil for your rock garden will be imported, you have complete control over soil conditions. A raised planting bed makes working with small plants much more comfortable, requiring less bending. The flowers are closer to eye level, making them easier to enjoy. This book of rock gardening tips is basic enough for beginners, but includes lots of insights for sophisticated gardeners. Canadian visitors: find Rex Murfitt’s book at Amazon.ca. 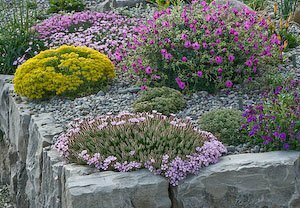 Another way to get into rock gardening is to grow rock garden plants in containers. Alpine troughs are especially attractive, and these stonelike containers are ideal for growing rock garden plants. Murfitt’s previous book, Creating and Planting Garden Troughs (co-authored by Joyce Fingerut and also published by B. B. Mackey Books) gives directions for making and planting garden troughs. In 2000 was voted “Book of the Year” by The American Horticultural Society, and, indeed, it is the best book I’ve seen on how to make and plant up alpine troughs. With troughs, you can create a complex miniature gardens. Alpine plants can also be grown in many different types of containers that fit artfully small spaces such as patios and balconies. Canadian visitors: find Rex Murfitt’s books at Amazon.ca.